At the moment I am working on a new figure project, but what is it? is it a bird? is it a plane? Once again I had the urge to cut up cardboard boxes and make something creative, and so my mystery project is born, and in less than an hour I had one side done. And up goes the second half, I am a wiz with the craft knife and box-tape. Then on goes the back wall. And here are two of my lovely figures checking out the new digs. Then a bit later on I put in a railing and a step so my figures don't fall and hurt themselves. 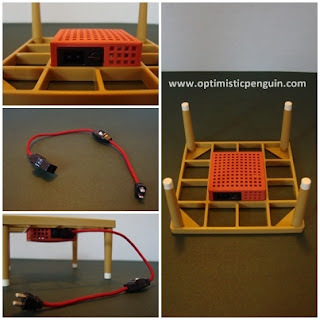 Popsicle sticks and kebab sticks can be used to a number of things besides food. Here is how I am going to use popsicle sticks as skirting board to go over the wall paper. 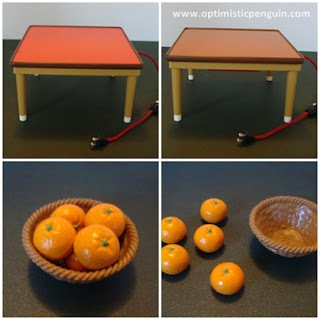 I also purchased a new piece of furniture via e-bay for my mystery project. It's a Re-Ment Kotatsu. And its just great, the detail is awesome, they have a little heater on the bottom and even a power cord. It also has a changable table top, one side is red and one side is a wood finish. There is also a fruit basket of oranges. 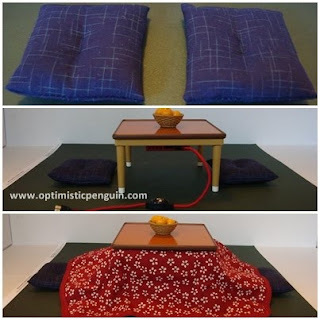 Then there are the cushions for sitting or kneeling, and the Kotatsu blanket, how cute and snug. 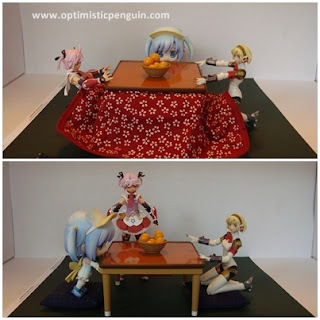 Although the Kotatsu is a bit large for the figures, it works better as a normal coffee table without the blanket, as the blanket raises the height of the table a little. 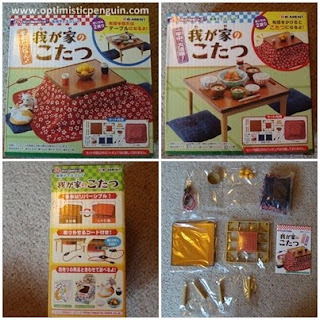 However the Kotatsu will serve the purpose I bought it for, and what purpose is that you may ask? Well I am not telling you its a mystery!! !